by Andy Higgs in Europe, France, Places, Stay. 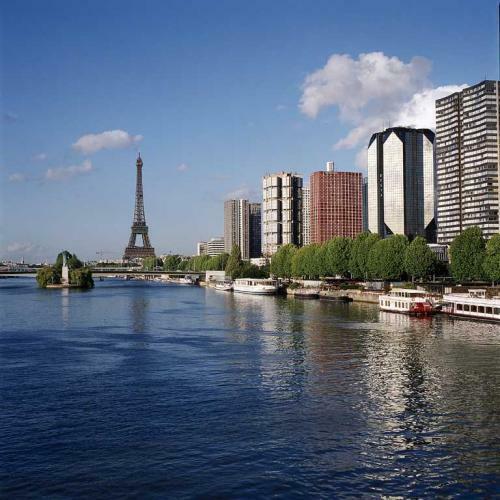 When visiting Paris in May you may remember we were rather taken by the Sofitel Paris La Défense which is a great choice if you don’t mind a quick trip on the Metro into town. This time we had our daughter with us and time was limited so we opted for a hotel nearer to the sights, more specifically near to the Eiffel Tower. Hmm. A tough act to follow? Yes, we certainly enjoyed the luxurious Sofitel, but the Novotel Tour Eiffel (which is also part of the same Accor chain) had some decent reviews and also had a pool, which is always a bonus when our ten-year old is in tow. I see you had to drop a star too though – must have been tough? Well you know, we make these sacrifices for our children, don’t we? Four stars. Opened 1972, 764 rooms over 31 floors. The hotel is, as you can see from the photo here, on the bank of the river within walking distance of the Eiffel Tower (about 20 minutes on foot) although the view is obstructed by the neighbouring tower blocks which is a bit of a shame. From the bridge over from the hotel you can access the Île aux Cygnes, the man-made island in the middle of the Seine with one of the three replicas of the Statue of Liberty at one end. Film fans will also enjoy the fact that the walk to the Eiffel Tower passes the bridge used in ‘Inception‘. There are two Metro stops within a ten-minute walk of the hotel. So all in all an excellent location. You’d be nuts to drive in Paris but if you absolutely have to you can make use of the hotel’s indoor car park for a fee. 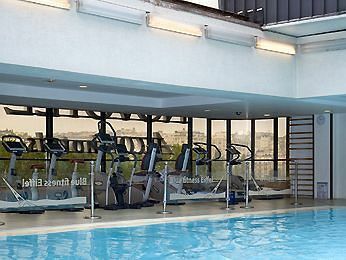 As mentioned we had limited time in Paris so a location near our main target attraction (the Eiffel Tower) and a pool were the two main criteria. 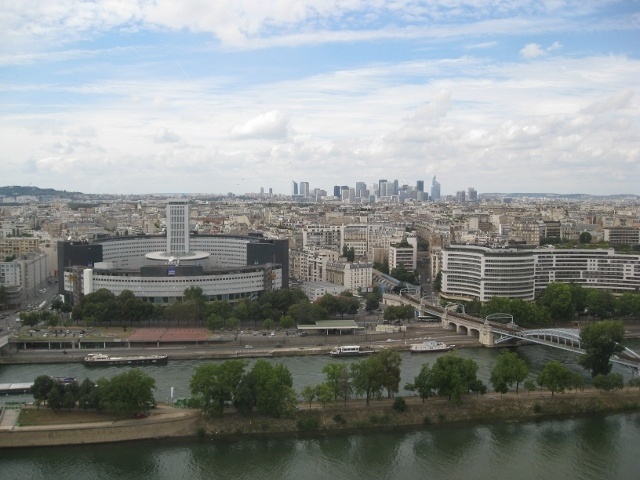 The room was large and being on the 22nd floor had a spectacular view over the Seine and towards La Défense where we’d previously stayed. The room was showing its age but the rounded windows gave it a pleasant retro feel. 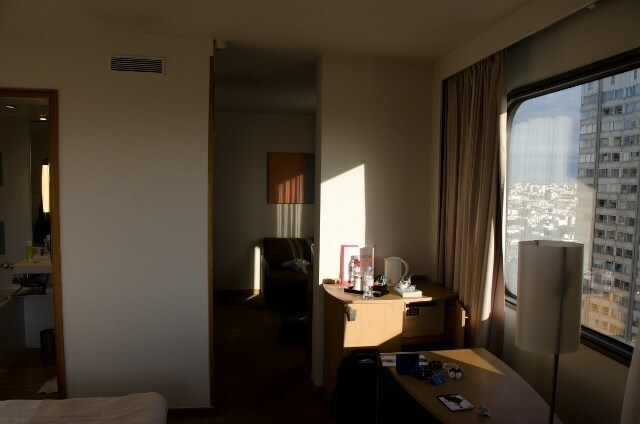 The features were as follows: LCD flat-screen TV, writing desk with chair, iron, telephone, wired internet. The double bed was large and comfortable and our co-traveller slept well on her sofabed. Alas, there were carpets. And they were pretty rough, with a few nasty stains. I hope the entire hotel gets a refurbishment one day and they go with wooden floors. They still have smoking rooms here too making carpets even ore of a dumb idea. 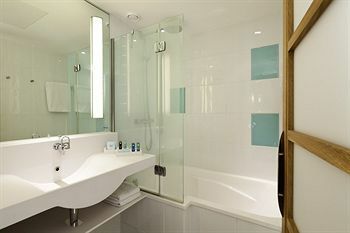 We had both a shower unit and a bathtub in a small bathroom. Unfortunately the shower door failed spectacularly – water ran onto the bathroom floor and straight into the bedroom carpet as there was no doorstop. This had clearly happened since the hotel opened as the carpet was rotten – and I dread to think what it looked like underneath the bathroom floor. Is it really so hard to design non-leaking shower doors? Individual toiletries were provided. Well, there was supposed to be free internet in the lobby only using a code, but I managed to access it from our room 22 floors up – so either my wireless card is amazing or they’ve boosted their signal. There were computers for the use of guests (which were constantly occupied) in the lobby too, and if you happened to be carrying a cable you could use wired access – for a fee. Not good – make it free and universal please (in fairness it was for me, but I can’t vouch for access from other rooms). Several options here from a cafe to a Japanese restaurant. There was also a pleasant bar with a limited range of food. The cafe has outdoor seating overlooking the river too. Yes, a small indoor pool which was also looking its age. Not great, but a pleasant diversion. No. Much like at the Sofitel you are charged extra for breakfast, and in any case we had other plans so didn’t try the buffet. It was expensive compared to that available at one of the numerous cafes in the area so seems a little unnecessary. 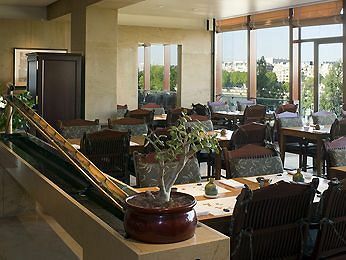 It seems common to charge extra for breakfast in Paris hotels but someone has to be the first to start a revolution. What about it, Accor? Service was fine – our only contact with the staff was checking in and out and in the bar and everyone was polite and efficient. Yes, you can earn points for the clumsily titled Le Club Accorhotels scheme. It takes quite a few stays to get enough points for a free night but it is quite easy to get free Platinum status (they offer it during campaigns a couple of time a year) to get the free room upgrade and a few other perks. Yes they can, although we didn’t need this service I saw they had ample space. Not a lot of information so I’ll update this section if I can get any more details from the hotel. 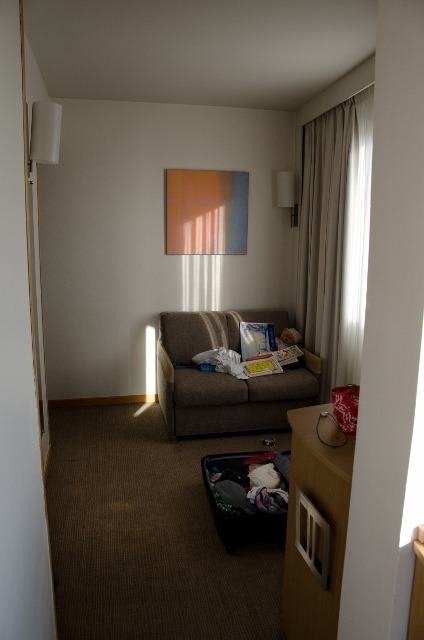 We paid EUR 150 for a double room (for three – this was with an extra bed) but as always prices vary – this was the summer. Advance payment at the weekends is always the cheapest. Good value for Paris, especially for families. Excellent location and fantastic views if you are on the higher floors. Internet should be free and accessible everywhere in the hotel. Breakfast should be included. Trash the carpets and make it completely non-smoking while you’re at it. The whole place needs sprucing up. 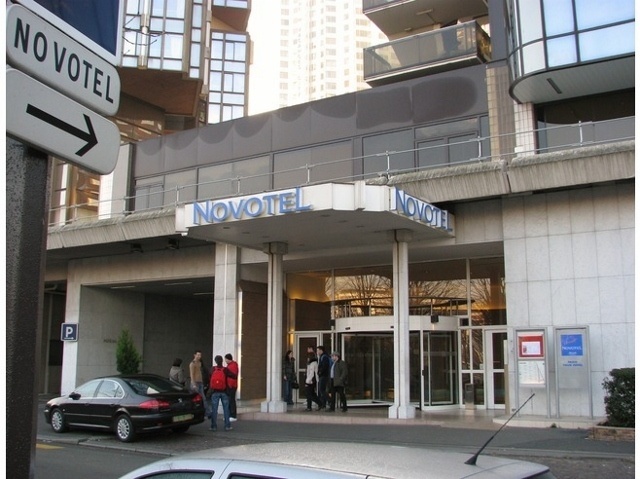 Despite a few negative aspects we had a great time at the Novotel Tour Eiffel. The location is fabulous as are the views; it needs a little polish but we’d still recommend it to those visiting Paris. If you crave more luxury for the same sort of price (although I believe they only accept 2 adults per room) you’ll need to move further out, in which case the Sofitel is the one for you.